Planning to take a relaxing holiday in Fuerteventura? 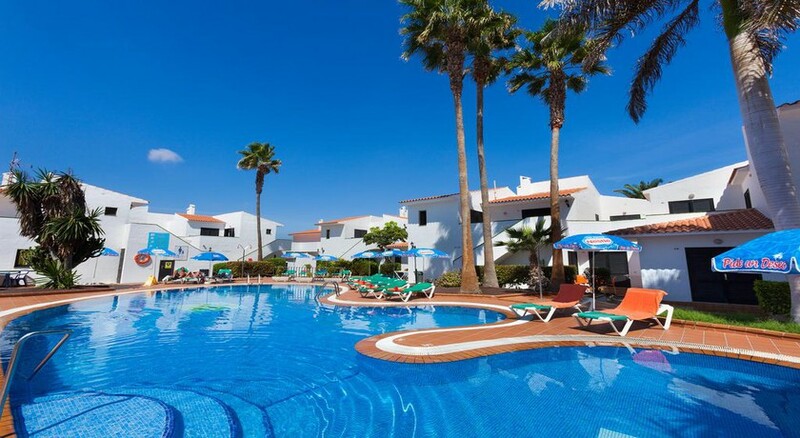 Check out Puerto Caleta, a hotel that boasts close proximity to the resort centre as well as the beach. Couples, families and group travellers are the most frequent guests here due to the hotel’s wide-ranging rooms and of course the fabulous location. The hotel offers bed & breakfast and half-board accommodations. With a pool bar, outdoor swimming pool, plunge pool and a solarium, the hotel comes in the list of one of the best resorts in Fuerteventura. Puerto Caleta has an on-site restaurant which serves both local and international dishes alongside alcoholic and non-alcoholic drinks. Apart from this, you can take advantage of the car rental service to explore a few attractions like EcoMuseo de Alcogida and Casa Museo Unamuno Fuerteventura and the Fuerteventura Golf Club. 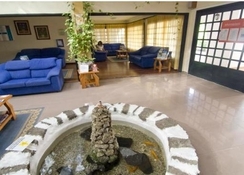 Located in Caleta de Fuste (Antigua), Fuerteventura, Puerto Caleta is a three-star property. The Fuerteventura Airport is roughly 9km from the complex and the distance to Puerto del Rosario, one of the biggest towns in the island is 14.5km. This is the perfect destination if you have lots of outdoor and adventurous activities in your itinerary—windsurfing, kite surfing, surging, snorkelling and other motorised & non-motorised water sports. Towns such as Nuevo Horizonte and Salinas del Carmen are ideal for a day trip. And you can consider trekking and hiking around the barren hills. 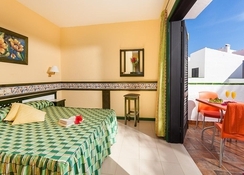 Puerto Caleta houses comfortable guestrooms that are fully furnished and functional. Apartments are bright and modern—they are finished in light colours and the interiors are rather chic. 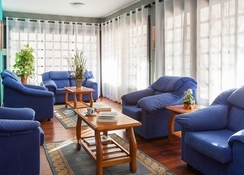 The apartments are also basic, but nothing short of modern facilities. The kitchenettes have electric hob, electric kettle, toaster, fridge, microwave, dining table and chairs and cutleries. And in the rooms, you will find en suite bathrooms with bath amenities, safe deposit, furnished balcony, sofa/sofa bed, telephone and TV with satellite are common—you might have to locally pay to use some of the facilities in the room. Most of the apartments have twin beds but you can request for extra bed and crib—housekeeping and clean towels and linens are provided regularly or on request. There is a restaurant that serves breakfast, lunch and dinner with plenty of choices. The menus cater to local and international cuisines and they’re quite delectable. In addition, the hotel houses a traditional bar, where alcoholic drinks are served—the menu features beer, cocktails, whiskey and other regular liquors. During day time, the poolside bar is popular as this is where light meals, snacks and refreshing beverages (both alcoholic and non-alcoholic drinks) are served. Also if you wish to explore the neighbourhood, there are lots of restaurants, cafes and bars. The hotel boasts an outdoor swimming pool—it comes surrounded with parasols and in the adjoining area is the kid’s paddle pool. You can play various water games in the pool or choose to walk to the beach, which is only a couple of minutes on foot. Hiking, strolling and snorkelling are pretty popular around the resort area, but if you want something luxurious, the Fuerteventura Golf Club and Gold Salinas de Antigua are within 10km. The town's local harbour is about 900 metres away and you can look forward to sailing, boating and fishing. Apartments very basic old fashioned , very clean TVs fridge microwave the usual , lovely not too big pool with a kiddies one aside to it , lovely little pool bar an underneath near reception restraunt although basic accomadation location is fantastic with lots of bars eateries nice places to do some Holliday shopping an all great rounder for families or even couples of all ages no need for all inclusive you have everything on the door step here at great prices .